What happens on our wild dolphin adventures? After cruising between 1/2 and 1 hour (depending on the boat we use) we arrive at "the dolphin grounds". This is where we begin to keep on the lookout for Atlantic spotted and/or bottlenose dolphins, the two species which frequent these waters. Hopefully our search is rewarded and we find the dolphins. More often, it seems, they find us! These dolphins are in no way captive or restrained. They are completely wild. We do nothing to encourage them. Our experienced crew tells us when to enter the water. 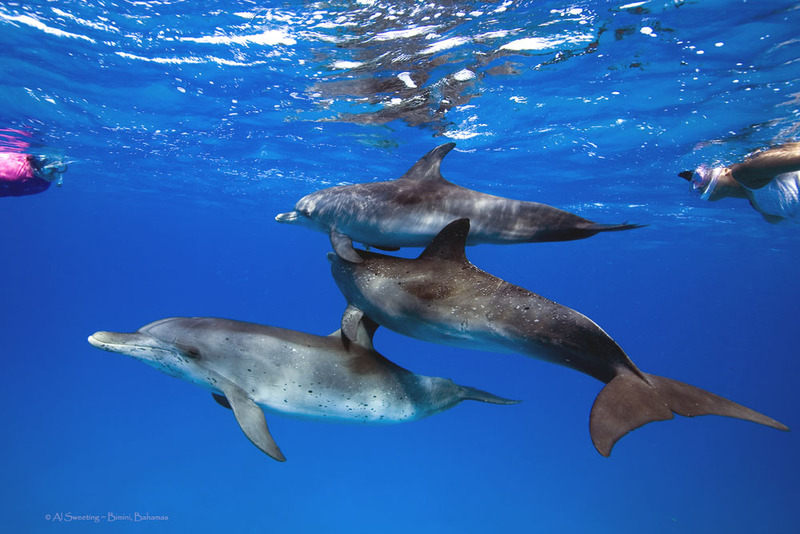 The dolphins tell us if they are willing to swim with us. If so, what happens next, you have to experience to believe. Each encounter is different. Some longer, some shorter. Some tranquil, some energetic. Always memorable. After our swimming is through, we cruise back to Bimini with the setting sun at our starboard side. We cannot stress enough that these dolphins are wild. REALLY WILD. Not captive or trained. Never fed or rewarded. They live in the open waters, not a bay or harbor. Sometimes we DO NOT find them. Sometimes we find them and they will not swim with us. If you cannot handle uncertainty, this may not be the right activity for you. That being said, our success rate in any given season exceeds eighty percent. This activity involves snorkeling in open water usually between 20 and 50 feet deep. You do not need to be an athlete, but some degree of physical strength is needed for keeping up with the group and getting on and off the boat. If you have doubts, please ask us. We're happy to advise you. Most importantly, this is an eco-friendly activity. We do not touch, feed, chase, or harass the dolphins in any way.